Butterfly-pea (Clitoria ternatea) is a plant that is common to most of South East Asian countries. In Indonesia can be found in the forest or in the yard of a house that is usually used as an ornamental plant. This plant generally has a bright blue flowers, but actually this plant also has a different color variants such as white, pink, and purple. These flowers can be utilized for a wide range of purposes such as food coloring, cake, or as a beverage making ingredient. Butterfly-pea flower has been brewed for centuries but only recently been introduced to tea drinkers outside the indigenous area. Butterfly-pea flower tea is a Caffeine-free herbal tea, or tisane, beverage made from a decoction or infusion of the leaves of the Clitoria ternatea plant and dried Lemongrass. The ternatea is also known as butterfly-pea, blue-pea, Aprajita, Cordofan pea or Asian pigeonwings. One of the interesting aspects of the tea is the fact that the liquid changes color based on the pH level of the substance added to it, for instance, adding lemon juice to the tea will turn it purple. 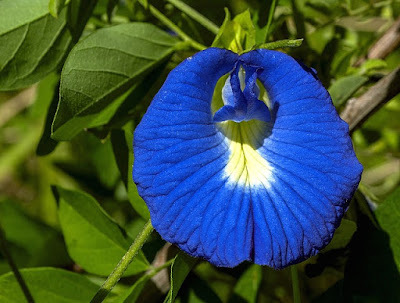 In many countries Clitoria ternatea have various names, such as Aparijata (for Hindi society), nagar hedi (for Canadian society), Dok anchan (for Thai society), and Sankhupushpam (for Malayam community). In English, this flower gets the nickname of butterfly pie, pigeon wings, and blue pie vine. In Indonesia, this flower has several names or designations, such as teleng (for the Java community), telang (for the Sundanese), as well as temen raleng (for Bugis society). In the leaves we can find some chemical compounds such as kaemferol 3-glukoside, triterperroide. This plant is famous for its toxic roots, where it has pharmacological effects such as laxatives, diuretics, blood purifiers, and as a vomitative stimulant. While the seed of the flower has a mild laxative effect and can be used as a worm medicine. Traditionally, the benefits of Butterfly-pea flower have been widely used by various societies as a remedy for vision disorders, such as red eyes or other eye pain. In addition, the efficacy of this flower is believed to help human vision brighter. The trick is to soak some flower buds into a glass of water until the water color changed to blue. Next you can use the water immersion as a sick eye sore. To overcome the disruption that occurs in the ear, we can take advantage of the leaves of this plant. The trick is to apply aqueous juice made from a few strands of the leaf with a little salt mixed in the ear that feels pain. Do it regularly. Ulcers (abscesses) on the body can be overcome naturally using Butterfly-pea flower. To use it, mash Java together with Java sugar. Apply the concoctionto on the ulcer. Do it until the ulcers healed. Dirty blood can be a trigger for various skin disorders such as the occurrence of ulcers. To overcome this, you can take advantage Butterfly-pea roots. Boil the roots and drink it regularly. This herb is believed to be able to wash the blood. Bronchitis or inflammation of the respiratory tract can be overcome by using herbs derived from the roots of this plant. The trick is to boil +/- 30 to 60 grams of Butterfly-pea roots with 4 glasses of clean water until half remaining. Consume this potion in cold conditions in the morning and evening each 1 cup. Butterfly-pea flower teas made from fireworks can be used to remove toxins contained in the digestive system. How to make it is easy enough, just by brewing 2 to 3 flower buds with hot water, leave +/- 10 minutes. The potion is ready for consumption. To add tea flavor, we can add honey or lemon juice into it. Good luck! Butterfly-pea roots has also been used in traditional medicine in such as to treat whooping cough (pertussis). In addition, the spice derived from the root powder of the telang can also be used to cure asthma disorders that afflict a person especially in winter. The benefits of Butterfly-pea are also believed to treat throat infections, especially for those who like to smoke. To use it, boil the root of Butterfly-pea and use the boiled water as a mouthwash. Butterfly-pea roots containt antidepressant properties reduce stress level by providing a calm, happy, and peaceful effect. Butterfly-pea can improve Human Brain's Memory Capacity. The flower is often used to treat various diseases related to the brain. Butterfly-pea also has a very positive effect on the human nervous system, so it can help in strengthening the nerves in the body and improve brain function.